The Training and Technical Support materials provided by TopApplianceParts.com web site are intended for viewing and use by qualified service technicians. 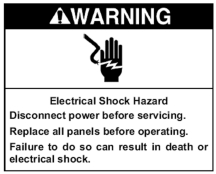 If you do not possess sufficient mechanical and electrical skills and the ability to follow all safety warnings and cautions on the product, in the product literature, such as set forth below, and in these materials, do not attempt to undertake the repairs that are depicted in these materials. Instead, contact a qualified In Home Service Professional (IHSP). TopApplianceParts.com disclaims any and all liability and by accessing this site, you agree to waive any liability against TopApplianceParts.com. To accept and continue, click the "Accept" link below. To decline, click the "HOME PAGE" link below. I ACCEPT the terms and conditions, and wish to enter.